It's fake, but damn if it doesn't look fun. 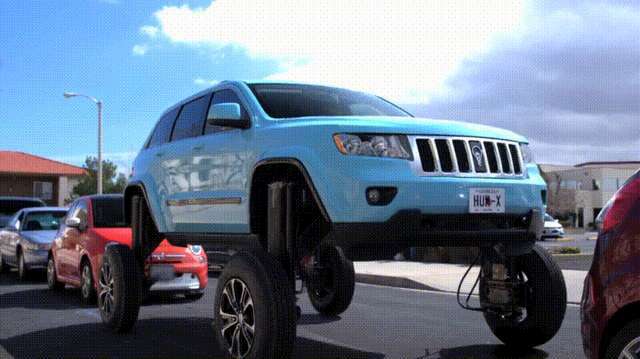 The Hum Rider is a Jeep Grand Cherokee tricked out with hydraulic lifts that allow it to tower high enough above other cars in front of it. That way, the driver can give traffic a giant middle finger and ride on past the bumper-to-bumper nonsense, unperturbed. Reddit went wild over this thing, presumably because it looks freakin' awesome, and we all hate traffic and grew up watching Inspector Gadget or Transformers reruns. Asked about this new approach, Verizon's VP of marketing Jay Jaffin told Mashable the new ad is "a bit of a metaphor, taking the ordinary driving experience and making it extraordinary." One of these Verizon dongles costs $29 and the service -- which offers car diagnostics, roadside assistance, and location and speed tracking -- costs $10 a month.